These Transitional Spaces is a group exhibition organized around contemporary art objects whose representational imagery crystallizes the temporal. The exhibition is curated by artist Seth Kelly for the not-for-profit art space, Franklin Street Works in Stamford, Connecticut. The art in These Transitional Spaces was chosen for its ability to simultaneously represent the time of its making and suggest the impossibility of a specific time and space being fully captured. These qualities allow for the works to serve as visual thresholds within the gallery, prompting viewers to imagine alternative spaces and histories. Artists include Matthew Buckingham, Matt Ducklo, Ilana Halperin, Dana Hoey, Adam Putnam, Karsten Krejcarek, John Miller, Matthew Ronay, and Aura Rosenberg. 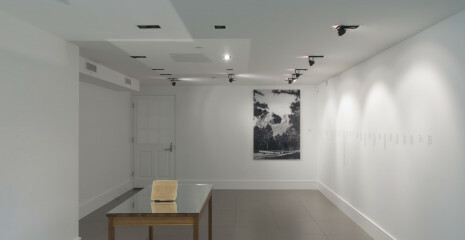 The exhibition is on view June 30 – August 26, 2012. The free, public reception is Saturday, June 30, 5:00 – 8:00 pm. Can representational visual systems evoke presence and absence of space transforming it in the same ways that abstract works using light, color, and shape do? These Transitional Spaces proposes spatial transformations that expand beyond an abstract game of the senses. Everyday scenes, objects, and shared histories act like a distorted mirror that transitions viewers from actual time/space to imagined eras, interiors, and worlds via videos, sculptures, and photographs. These works alter our sensory and psychological relationships to physical environments, including those of exhibition spaces themselves. With Matthew Buckingham’s The Six Grandfathers, Paha Sapa, in the Year 502,002 C.E. the grand symbolism of a nation’s leaders, fathers in stone, is transported into the future through photo manipulation, sparking viewer imaginations and challenging them to cognitively contextualize an unforeseeable future. Ilana Halperin, on the other hand, evokes the past via new, cast objects made of the mineral composition found in cave formations such as stalactites. In both, the past and present are shifted through suggestions of other times and places. The real and imagined take a more whimsical, sometimes satirical, turn with the inclusion of Dana Hoey’s Rainbow Painter – the photo features a romanticized, lounging artist and his muses; a floating plastic pear that is John Miller’s sculpture Pear Ubu; and the plastered smiles and stiff styling of Matt Ducklo’s WTVY Dothan, 2011, from The Newscasters series. These works suggest other spaces through the inclusion of set-like elements. With Ducklo’s photograph, characters that usually enter our homes from the virtual dimension of television in the form of light and sound are frozen, waiting for their cue. In Hoey’s photo, a “rainbow painter” and two young women recline by a tree, framed by a rainbow painted onto a concrete wall. The painting within the photograph is made in a style that straddles trompe l’eoil and street art. Its artifice is obvious and a bit out of place, creating a tension in the photograph between the urban and pastoral, between the earthly and the heavenly. With Pear Ubu, the humble plastic pear escapes the fruit bowl and gravity itself, simultaneously becoming a mental prompt and a theatrical prop in the gallery. These Transitional Spaces also expresses its spatiotemporal concerns through the visceral. With Adam Putnam’s live video feed of an architectural model, the breathing “bones” of a building’s interior anthropomorphizes domestic space, creating a “living” room from a static object using a “live” video feed. The location becomes the subject, sexualized, yet devoid of human bodies — a place of projected space and fantasy existing silently on its own. In The Astrological Ways, Sagittarius, by Aura Rosenberg, inverted silhouettes of paint on canvas float within the field as the canvas floats on the wall. Like a pear hovering in the gallery or a rainbow painted on cement, these white bodies drifting in black space are plucked from any typical living situation and are then aligned thematically with a heavenly pseudo-science through the artwork’s title. Also grounded in black and relating to the figure, Matthew Ronay’s Cloak of Tears is a collage painting on black canvas that references ceremonial dress, transforming the wearer into a sign of cosmic totemism. Finally, a disembodied voice hovers over the art space’s threshold, a location symbolizing transition between architecture and the world, in Karsten Krejcarek’s Nueva Era de Santo Daime. In this sound piece, a voice calls to the woods from a fictional time in the future. With Nueva Era de Santo Daime, time, space, and body coalesce in a fictitious, time-bending narrative that aids in transitioning the visitor from exterior to interior as they enter the gallery. The venue of Franklin Street Works is an exhibition space with a history of physical alterations. A nineteenth-century house with elements of the interior organized by the Bauhaus line via recent renovations, this location offers a unique setting in which to highlight the shared nature of these artists’ concerns surrounding the spatiotemporal. The art space’s transitions, whether historical through use and renovation or from room to room as visitors travel the building itself, create a metaphorically rich environment in which to examine art’s aptitude for transitioning our space via imaginative conjecture, subject, and compositional structures. Matthew Buckingham, Matt Ducklo, Ilana Halperin, Dana Hoey, Adam Putnam, Karsten Krejcarek, John Miller, Matthew Ronay, and Aura Rosenberg.